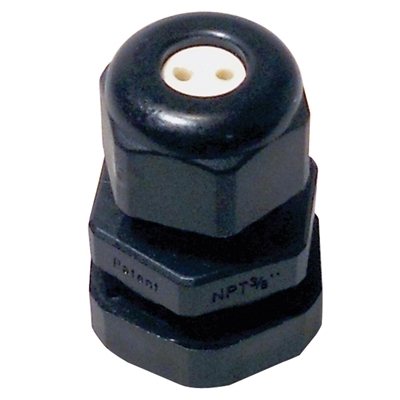 These electrical bulkhead fittings feature a 2-wire standard "wire-through" design. This electrical bulkhead fitting allows you to run your fuel pump wiring through a stock fuel pump hanger for a Walbro 450, 525, or other high flow in-tank pumps that draw too much amperage to use stock wiring. It can fit up to two 10 gauge wires as long as they don't have an extra thick outer jacket. It has a o-ring seal for the hole you;ll need to drill in the hanger, and the nut on the top squeezes the seal around the wires. We have used these for years in stock fuel tank hangers with E85 with no leaks.